Tempera paint originally contained egg protein and artists during the Renaissance period used it for fresco and hardboard works of art. Modern tempera paint also contains organic proteins as well as non-toxic preservatives. This type of paint is an excellent choice for classroom and home-based projects. It provides opacity and coverage on non-greasy, absorbent surfaces such as cardboard, construction paper and plaster cloth. You can also use tempera paint on glass objects or surfaces, but you will need to take a few special measures to keep the paint from running or smudging off. 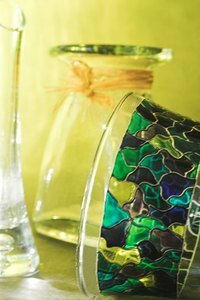 Select the glass object that you would like to cover or decorate with tempera paint. Choose a piece that has an interesting shape and appealing lines. Decorative items like candleholders, vases, picture frames, plates, cups and mugs are nice choices for a tempera paint project. Make sure that the glass you have chosen is clean and dry. If it is slightly greasy, use rubbing alcohol to remove the grease. Decide on the tempera paint colors that you would like to mix and use. Apply a few strokes of the desired colors to get an idea of just how the end result will look. Glass is non-porous and does not require large amounts of paint. Squeeze small amounts of your color choices into individual containers and reseal the bottles. Close the caps tightly to keep the unused paint from air exposure. Gather your natural or synthetic paintbrushes and get to work. Use a paper pattern inside or underneath the glass object and paint on the outside of the glass to create bold geometric and floral shapes and designs. Try using sticky paper stencils and an applicator sponge to apply the tempera paint to the glass as well. Use water to dampen a paint brush and brush it lightly across the wet tempera paint if you would like to create soft edges to your work. If the design for the glass piece requires blurred edges, simply use a fully wet brush to brush across the edges of the paint area. Create hard edges by loading a flat watercolor brush with tempera paint. Use even strokes to apply the paint to the glass object, building a thick edge around the color. Allow the paint to dry completely before you paint the other areas of the piece. Use an over-painting technique to apply decorative touches to paint that has already dried. Spray paint the finished product with a thin layer of clear acrylic if desired.